Finding work-at-home jobs in countries other than the U.S is a significant challenge for many work-at-home job seekers. Every day I get many emails from my readers asking about remote jobs in countries like India, Australia, Philippines, South Africa, Indonesia and more. Although the work from home culture is not very prevalent in these countries, there are some work-at-home jobs available in these locations. I am from Australia, and it took me a long time to find a legitimate work-at-home job just as it does many others from different locations. It takes a long time to find authentic online working options amidst the scams. Many work-at-home seekers do not have the right resources to start looking for work-at-home jobs. 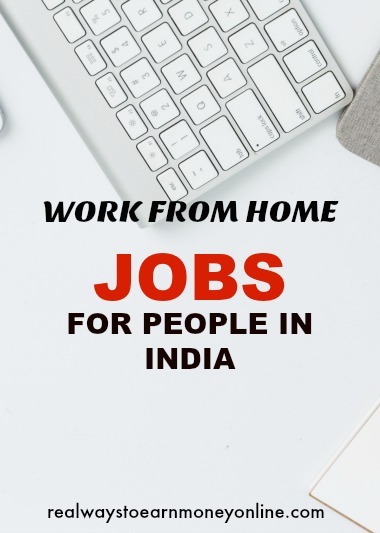 Today, I am going to list the companies that offer work-at-home roles in India. Although working from home is not very common in India, there has been a rise in remote job seekers in recent years. Online tutoring might be the most flexible and accessible option for many who want to work from home. In recent times, online teaching has become popular because teachers are able to use platforms like Skype, Zoom, Google Hangouts, for providing lessons. Tutorvista – You need prior experience and a Master's to teach with this company. The subjects that are taught are English, Math, Chemistry, Biology and more. Vedantu – This online tutoring company teaches subjects like Biology, Physics, English, German, Sanskrit, etc. Once you submit the online application and pass the screening test, you will have to give a demo class. Vedantu provides training to the successful applicants. Teacheron – With this platform, you can create a tutor profile and students will choose the tutors according to their needs. Virtual assisting is gaining popularity in India right now because of the many services you can offer and the flexibility of the work. Brickwork India – This is a famous virtual Assistant company that hires for a ‘Remote Executive Assistant' position. The tasks include admin, IT services and research. LifeBushido – This company hires VA's worldwide, so Indian applicants are accepted. You can work for a minimum of 5 hours a week. You can also find freelance VA gigs on Upwork and Freelancer. TranscribeMe – This company hires transcriptionists around the world. After you register, you need to take an English exam. The payments are through PayPal. Scribie – Another good transcription company offering freelance transcription roles. After you apply online, you will be on the waitlist. Once you are invited for a test and pass it, you can choose the files to work on. They hire from many other countries in addition to India. As a search engine evaluator, you will be filtering the search engine results of Google or Bing following some guidelines. This is not a very technical role, and almost anyone can do this. Appen – This company periodically hires for remote social media evaluator positions. For this role, you will be evaluating social media results. You need to have active social media accounts to be able to apply for these positions. Lionbridge – This crowdsourcing company regularly hires for work-at-home internet assessors, map analysts, and ad assessors. The primary responsibility for all these roles is to analyse search engine results and rate them. They do hire from India from time to time. Leapforce (acquired by Appen) – Another very well known company that hires search engine evaluators worldwide, including India. All of these companies require you to pass a qualification exam prior to acceptance. If freelance writing is your forte, then you can look at companies like Writer's Labs to contribute high-quality articles on a variety of topics like finance, health, lifestyle, kids, etc. Freelance bidding sites like Upwork and Freelancer also tend to have writing work available that is open to people in India. If you love going through documents and correcting errors, then you can try some remote editing gigs. Although there are not many companies that hire editors in India, these two companies hire intermittently. Cactus Global – With this company, you will be editing manuscripts in fields like medicine, engineering, life sciences, etc. You need to have Bachelors/Masters in the required field. Enago – This company hires editors from various countries including India to edit documents related to Medicine, Physical Sciences, Arts and Humanities, etc. After you submit your resume online, you must edit a sample document to demonstrate your skills. If you are bilingual, then you can try remote translation jobs with companies like Responsive Translation, World Lingo or even Freelancer and Upwork. Appen also has some translation gigs for India. These are some short gigs that involve small data entry tasks, transcription, research, editing, listening to calls etc. Though the pay might be less, this work can be done from India. It might take time to find more legitimate work-at-home jobs in India, but if you look in the right places, there are some great options. Sireesha is a career blogger and avid side hustler. She helps other work-at-home enthusiasts in finding legitimate work-at-home options and side hustles though her blog, Crowdworknews.com. Please try applying to the companies mentioned in the post. There is no fees involved to apply.